If you have an interesting trivia, 'Bits and Pieces', pictures of your SD car, or other things, email it to me and I'll include it here. On VIN 157186, I completed the frame off restoration in July 2006 after I bought the car in March 2005 - A 16 year restoration project! The guy I bought it from lost interest in 1990 after he had the body and paint completed so it sat as an unassembled car until I bought it. The mileage now reads 34069 and the car won 1st place in the 1970 - 1976 Stock/Restored class at the T/A Nationals this past August. The body build date (from trim tag) is 05D or fourth week of May 1974. On VIN 159913, I bought the car in 2001 and it now has 48767 original miles (not shown). The car has mostly original paint, decals and interior. I did a "mechanical" restoration three years ago (rebuilt and detailed the motor, trans, suspension etc.). This car won the 1994 Pure Stock Drags in the stock class running 13.12 @ 106 mph. 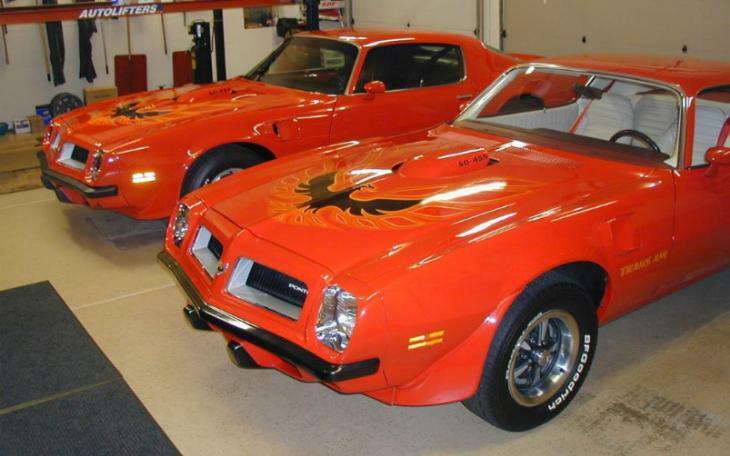 This car was also featured on the TV show "The American Muscle Car" about the Firebird Trans Am (many shots of the interior, exterior and the previous owner driving the car). 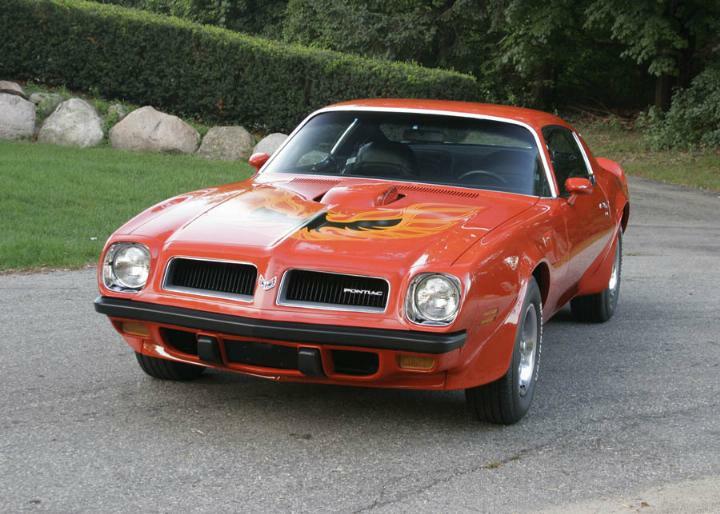 I came in 2nd with this car at the 2005 T/A Nationals in the 1970 - 1976 Stock/Restored class - not bad for a pretty original car! The body build date (from trim tag) is 06B or second week of June 1974. I am the fortunate fourth owner of both cars. 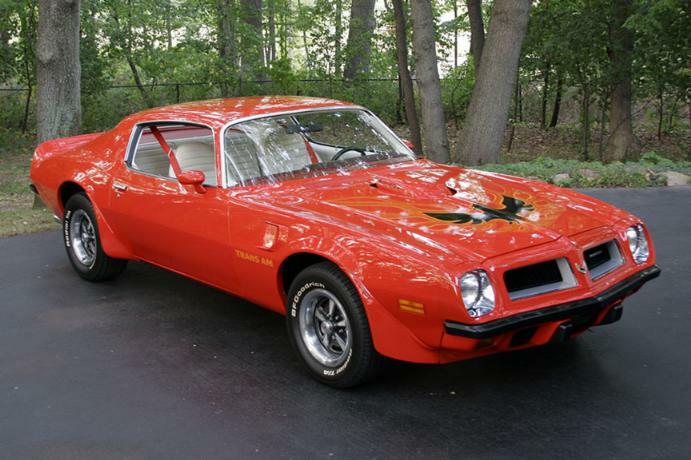 As a side note, after some research with other owners and Rocky Rotella, we are pretty sure that there was only one 4-speed transmission available for 1974. It was the "close ratio" Borg Warner Super T-10 trans that has 2.43/1.61/1.23/1.00:1 gear ratios. This trans was in some cases described as a "special close ratio trans" in the sale literature and it was when compared to the Muncie M20. However, it was not as "close" a ratio as the Muncie M-21. I believe that the trans designation for all '74 4-speeds should read T10 rather than M20 or M21. Only the 3.42:1 axle was available with the 4-speed and contrary to what some are saying, you could not get A/C with the manual trans (even though there are a few cars out there with it! ).